Recently 14 family members traveled from San Francisco to Tanzania to visit the SEGA Girls School. Our group consisted of 7 adults and 7 cousins, ages 14 -20. We started our journey to SEGA early in the morning from Dar es Salaam on a bus making our way towards Morogoro. There was so much to see along the way that our senses were on overload. It was a long bus ride and many of us were very tired from our 22-hour plane trip, but when we pulled up to the school and saw all of the SEGA students waiting to greet us, it made our day! Not only were we incredibly welcomed by all the girls, staff and teachers, but we were also greeted by the singing of the welcome songs, which were amazing and truly breathtaking to hear such strong and beautiful voices all in harmony. The very first day we were treated like family, everyone was so nice and welcoming it made us all feel at home. At first I was a little nervous because I was scared about being in a new environment, however as I got to meet the girls and spend more time together it was one of the best trips of my life. We wish we could have stayed longer! Everyone in my family went to Madam Jane’s Life Skills class. Not only was her class teaching the importance of not getting married at a young age but also to not be afraid of anything and the need and how to show confidence in life. There was a lot of role-playing, which was a lot of fun. My family and I had such a wonderful time at the SEGA School. My cousin Renee especially loved when we were taught traditional Tanzanian dances. Renee was so grateful that the girls teaching us were very patient with us because the dances were not easy to learn. Ben, another cousin loved learning how to play Netball. He is always up for a challenge and was so happy he got to experience a new sport and got to play a real game with the girls. Yes, we had stretching and warm ups first and the SEGA girls did win. They are great athletes! 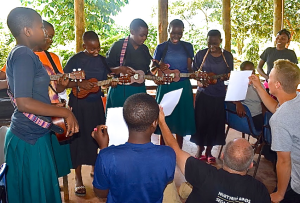 Other activities were working in the organic garden, an art project, a science project, visiting a primary school and teaching the girls how to play the ukulele. We also got to experience home visits, which were beyond any of our expectations. It was so heartwarming to meet some of the girls’ families as they opened their homes and hearts to us and we created new connections with them. We stayed in the SEGA Lodge, which was perfect as we were right on the SEGA campus and could experience so many activities with the girls. We also were able to have morning chai and lunch with them and spend time after classes just talking with them. The setting of the Lodge, at the base of the Uluguru Mountains is truly breathtaking. Tanzania has such unspoken beauty. We were all so happy that we were able to visit and meet such amazing people. My cousins – Cory, Renee, Ben, Jane, Cali, Lauren and myself, Ivy all had such a wonderful time! Experiencing everyone’s warmth and generosity is what made our trip to SEGA so special! Asante sana!